This big, brawny book is an absolute festival of fabulous motor-racing photography. Strikingly printed on glossy paper in large format, image after image by fine photographers stun with their impact and significance. Thanks to George Follmer’s (b. 1934) peripatetic career, which embraced the Can-Am, Trans-Am, Formula 1, Indy racing, Formula 5000, 24 Hours of Le Mans, SCCA Nationals, NASCAR stock cars and more, these images are a bright kaleidoscope of auto racing as it was in the 1960s and 1970s—the era of Follmer’s racing. We are dealing here with a man born in Phoenix, Arizona, on January 27, 1934, whose family moved to California two years later. Having been caught up in the Korean War, Follmer was married and still in college when he discovered in his mid-20s that driving his VW Beetle in gymkhanas was fun. This led to a race at Riverside in which he discovered that he “could drive a car to its limits. I was hooked and there was no going back. I loved racing. It became a very meaningful thing in my life.” In fact it grew to an obsession. Follmer had serious rewards for his efforts. He came on the scene as winner of the SCCA’s U.S. Road Racing Championship in 1965, at the age of 31. In 1972 he achieved a unique double, winning both the Can-Am and Trans-Am Championships. He was Trans-Am Champion again in 1976. George competed in the 1973 Formula 1 season. Gridding for the first race in South Africa he was 39 years and one month old, making him the oldest Grand Prix rookie since the 1950s. Nonetheless he achieved a podium placing that year with a third in Spain. We feel for George when Shadow gives him only one season in the G.P. circus. 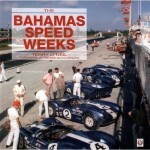 Interviews by Tom Madigan with Follmer’s friends and rivals pepper this book with revealing quotations. 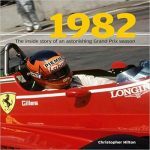 Admitting his previous passion for drag racing, about which he has written extensively, Madigan structured his book as an odyssey of discovery of both Follmer and new worlds of racing, disclosed through his interviews with team owners, designers, mechanics, friends and rivals on the track. We are invited to sit with the author as he quizzes surviving actors in the drama that was Follmer’s racing. An early step up for George had been his choice by legendary team owner Roger Penske to partner Donohue in T70 Lolas in the 1967 Can-Am series. Penske remembered Follmer in 1972 when Mark crashed during a test at Atlanta after the season’s first race, breaking a leg and damaging his knee. The car was the awesome turbocharged Porsche 917/10 whose 900 horsepower the team had tamed just enough to race for the Can-Am Championship. 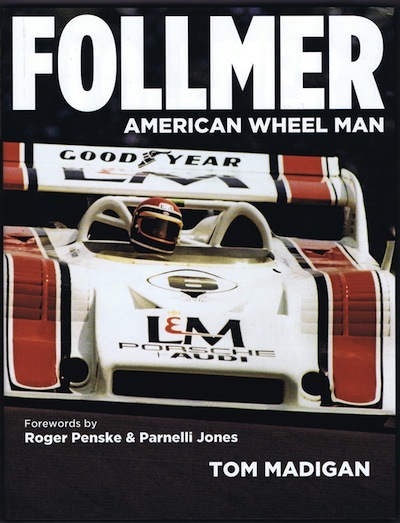 In addition to his late start in racing, Follmer was initially handicapped by a perception that he was a “small-car driver.” This arose from the success he had in 1965 when he raced a 2.0-liter Porsche-powered Lotus 23 in the U.S. Road Racing Championship. To even the odds for drivers of smaller cars, the SCCA gave the same points for placings in the under-2L class that it awarded to the big-car drivers. Follmer stole the Championship from Chaparral-driving Jim Hall in the series’ last race. In a book that is essentially a compilation of interviews, each covering the period with which the subject is familiar, lacunae are inevitable. 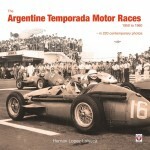 For example we are never told the identities of the 2.0-liter cars and drivers that Follmer beat to win the 1965 USRRC. 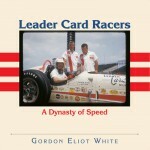 We could learn more about George’s Champ-Car racing, including three Indy 500 starts, when he owned his own team. The reader has to piece the story together himself. Many of the pieces, however, are fascinating. 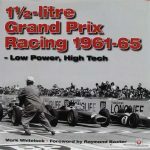 You will find an absorbing account of the extraordinary “knee-high” Mark 1 AVS Shadow Can-Am car that George drove in 1969 before handing over cockpit responsibilities to Vic Elford, famed for his salvaging of lost causes. You will also be invited into the equipment-crammed aerie of Don Nichols, the mysterious magus behind the Shadow cars that competed in the Can-Am and Formula 1. Bibliography, Index. 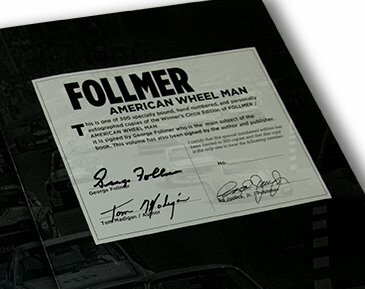 The standard book is called the “Qualifier Edition” but there’s also a “Winner’s Circle” limited edition of 300 signed and numbered copies (Follmer has, of course no. 16!) covered in linen and in slipcase, each with nine photos applied to the outside. $150. Copyright 2014, Karl Ludvigsen (speedreaders.info). Also appeared, in different form, in the SAH Journal vol. 268.